Personalized Cooler Bag for 36 cans, Custom Printed in Bulk or Blank. Inexpensive, Promotional. Budget Prices in the USA and Canada. 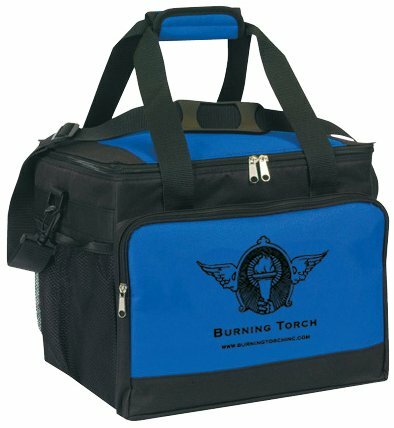 Our discount personalized 36 can cooler bag combines two functions: an extra large sports duffel bag and an insulated cooler for 36 cans and room for more items. It features insulated water proof/heat sealed lining, adjustable and detachable shoulder strap with rubber pad, front zippered gusset pocket, side mesh pocket, and a heat sealed water proof lining. 36 can capacity. Made from 600 Denier. We also supply wholesale blank (not imprinted) sports cooler bags for $11.20 each. Budget Prices in the USA for promotional sports cooler bags. American clients pay no taxes. We will send you a proof for your approval before production. Prices include your 1 color, 1 location custom imprint. Please add $0.80 per cooler bag for each additional imprint color. You may order any in-between quantity; assortment of colors is allowed. Typical Production Time: 7-10 days after artwork approval. It holds 36 cans with extra room.